What Do Your Cat’s Expressions Mean? Cats are quick studies. They also realize that because we don’t “speak” the same language, they need to rely on certain cat body language and expressions to let us know what they want. Like right now. They are highly skilled in unleashing charm to get us to give them what they want, such as treats, a good under-the-chin scratch or a lap for napping. Let’s take a look at three key feline moods based on cat facial expressions below. How it looks: The cat will catch your attention and then start to slowly blink his eyes at you. His body is relaxed. He may slowly come up to you and gently bump his head against your forehead, a move known as head bunting or head bonking. What the cat is trying to say: The cat regards you as a trusted friend. Cats that gently flutter their eyes and engage in head bunting for select people are conveying affection and trust. He feels safe with you and enjoys spending time with you. You’re the cat’s pajamas! How to respond: Blink back. Remember to open and close both eyes slowly. No winking and lower your head to receive the head bunt. Speak his name in a friendly upbeat tone and treat him to some scratches under his chin. How it looks: The cat’s ears are pulled back and flat against his head in a defensive position. His whiskers are stiff and out. His pupils are narrowed and the stare is hard and focused. The cat’s entire body is tense and the hair may be raised along the spine. He may even break his silence by hissing or releasing a low growl. What the cat is trying to say: This cat is giving very clear cues that he is angry and does not wish to be approached or touched. He is upset by something or someone in his environment. The cause may be something they detect, but we do not. Sometimes we can’t identify the source, but keep in mind that cats have superior hearing and smell. Ignoring his “back off” signals may result in the cat lashing out at you with his claws or his teeth and causing severe injury. How to respond: Heed the cat’s “back off” signals and give him space to escape the scene or stay and calm down. If the cat is on your lap, stop petting him, stand up and walk away. Attempting to coddle or appease an angry cat may result in the cat clawing or biting. If he does bite your hand, the best way to release his bite grip is to relax your hand and move it toward his mouth. Do not attempt to pull your hand away quickly. 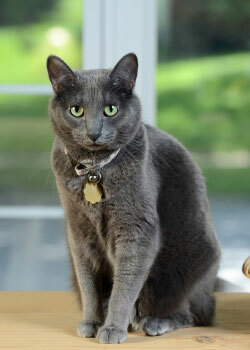 The cat may tighten his grip and bite deeper as he is genetically wired to do when he captures a mouse or other prey. How it looks: The cat is sitting or lying down with his front paws forward. His eyes are open with narrow pupils and looking at the source of curiosity without being a hard stare. His ears are up and forward and his facial whiskers are forward but without any tension. He may lift his nose in the air to catch a scent. What the cat is trying to say: He may be conveying to you, “Hey, I am slightly intrigued by what you are doing.” You have his attention and he does not feel threatened or agitated. Finally, he is closely observing you to see if the opportunity something beneficial, such as attention, a healthy treat or a play toy. How to respond: When your cat is in this curious mood, take advantage to connect one-on-one. Introduce him to a new game or perhaps a new food puzzle to work his mental and physical prowess. Or simply engage in an upbeat short conversation. He won’t know what you are saying, but will clearly know the friendly tone you are delivering to him. 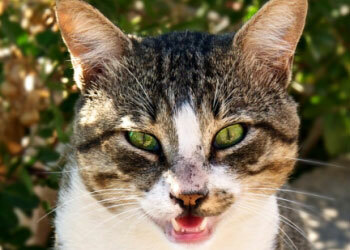 You can always brush up on what your cat’s meowing means to try and decipher what he’s saying to you as well. Am I a Cat Whisperer Yet? You’re probably not a regular “cat whisperer” yet, but with a little practice your cat communications skills will begin to show. So next time you talk to your cat (it’s ok we do it too) take a look at the expressions on your cat’s face. They might be trying to say more than you think. Learn More: We can’t always tell when our pet’s aren’t feeling well, luckily that’s why we have vets! Pet insurance can help if your pet gets sick or injured by reimbursing on the veterinary bills.